Lili Maglione presents her collection of abstract landscapes, the Ottava series, which are The Colors of Your Mind & Soul. The Ottava or octave tells us to play the indicated notes higher or lower than written or indicated. It is enough to be able to play, slowly, at your own tempo, a one-note bass in the left hand and one, two, or three notes in the right hand. You can begin to think of these notes as real voices. When there is a conflict between an old key or a new key, I try to favor the new. Bend a note and hold it. Be flexible. Enjoy the soundwaves, the harmony, and the eight colors of your mind and soul. New York artist, Lili Maglione, has won numerous awards and her work has been shown in many galleries , museums, and universities, including The Parrish Museum, The Heckscher Museum, and The Lafayette Museum of Art and she has been named "Woman of Distinction" by Distinction Magazine. Her work is in the collections of many prominent people and corporations including Elizabeth Taylor, Thomas Kellaway, Publisher of American Art Review Magazine; The Coca Cola Corporation; and Weight Watchers Inc. among others around the country and abroad. Maglione grew up on Long Island and studied in New York City at The Art Students League of N.Y., The Traphagen School of Art and Design, and also at Cadenabbia, Italy. She studied life drawing from the late Victor Perard and still life under the late Robert Brachman when he was teaching at The League. She also attended classes at NYU. 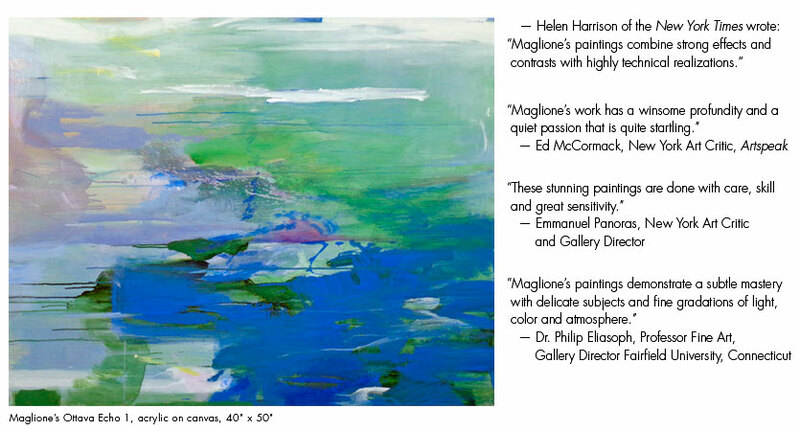 Ruth Tucker, Critic, Former Executive and Curator, Guggenheim Museum, NYC stated: "Maglione's expressions convey command, dynamism, and strength. These powerful and compelling paintings evoke sentiment and raw emotion as Maglione expresses her inner psyche and personal thoughts and dreams. Lili Maglione's paintings possess the power to bring the viewer to a standstill with it's arresting use of viseral qualities. Tracing the very soul of the artist seeping out onto the canvas, these poignant abstractions are filled with a breathtaking intensity." Member American Artists Professional League Inc. Copyright ©. All Rights Reserved. No part of this site may be reproduced without written permission from Lili Maglione.